The phrase is defined as "a schedule or workload that is filled to capacity with obligations, tasks, or problems." But what's on that plate? And how high are you stacking it? This exercise will take a look at the demands on your life-- work and life-- and how are they affecting your mental health. Careers in education have many, and varied, demands and expectations. And over time that list keeps growing! "live, work, and carry on meaningful relationships"-- what is used in identifying a mental health concern. 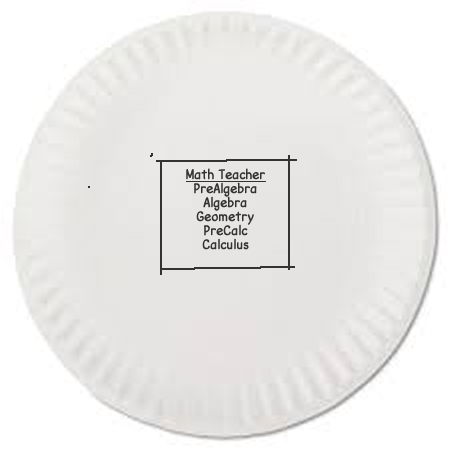 Grab a paper plate, three colored markers, and a highlighter. In the center of the plate, write down your job title (5th grade teacher) and your core teaching responsibilities, those things that were listed in the job description. Draw a box around this. 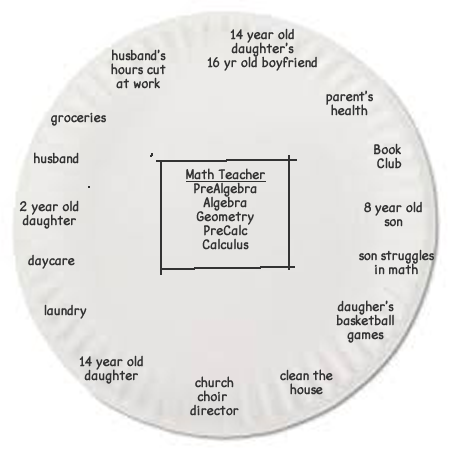 With the same marker, go to the outer ring-- the ruffled part of the plate-- and write your outside of school time demands and concerns (children, husband, church, 4H, Lions, family health, family finances, drive to work, outside job, etc.). Things that take your energy and time. 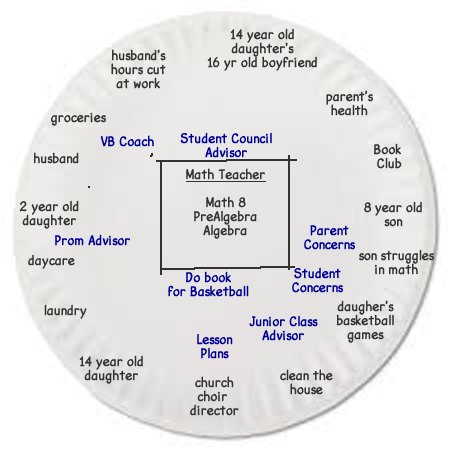 Grab a different colored marker and on the rest of the plate start writing in other school related responsibilities-- things that are assigned, you're expected to do, or that you've created or volunteered to do. Try not to write into the outer ring unless you have to. This could include PBIS, UDL, PLC, DAC, ACP, Youth Apprenticeship, class advisor, Forensics, creating a new class, taking a class, pep band, coaching... you get the idea. Look at your plate. 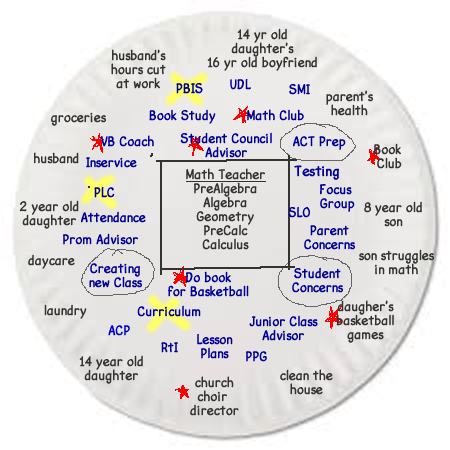 With your marker, circle the three school additional responsibilities most important to you right now-- those things that you feel are the most important to you as an educator. They may vary from year to year, but what are the most important for you to work on this year. Look at your plate, and with a red marker, star the items--either school or out of school-- that "fuel" you or give you energy. They may take time but they give back positive energy and keep you motivated. Last step, again look at your plate. With the highlighter, put an X on three things that drain you-- tasks and expectations that consume energy and time without giving much in return. ​In economics, these would be referred to with the Law of Diminishing Returns. Discussion... let's talk about your plate. Are you comfortable with your life-work balance? If not, what effect is it having on you? How much control of your plate do you have? How is that impacting your stress level? What is your current stress level? We identify a mental health concern when factors are affecting a person's ability to work, live, and carry on satisfying relationships. The Teacher Stress Inventory asked you to look at factors that might be affecting your mental health. Teacher responsibilities ten years ago... compared to responsibilities today. ​And you're not alone, nationwide teachers are feeling the stress. Even the Nation's leaders know there is a problem. What's next? What would you like to see happen? How can we effect that change?